The University of Cincinnati has begun work on the new 110,000-square-foot Health Sciences Building in Avondale. Located along Panzeca Way, immediately north of the massive Eden Avenue Parking Garage, the contemporary four-story building will house classrooms, labs and office space for the College of Allied Health Sciences. According to project manager Dale Magoteaux, classrooms will be located throughout the building, while lab and office space will be located in the building’s south and north wings, respectively. 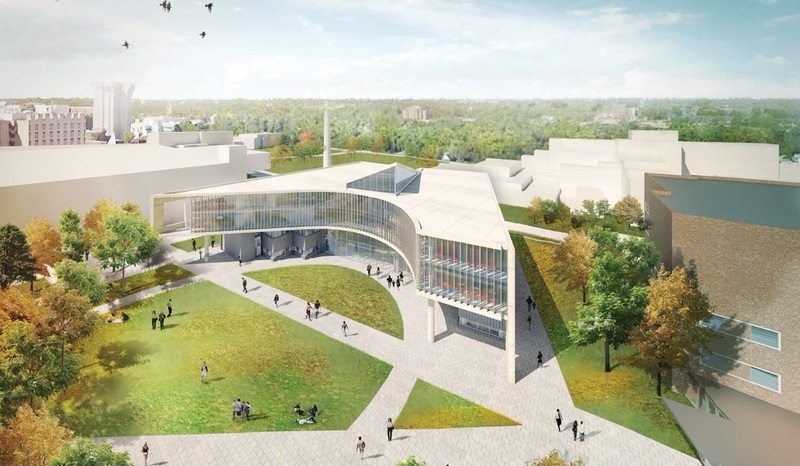 The dean of CAHS, Tina Whalen, says that department heads closely coordinated with building designers to ensure that the needs of students, researchers and faculty were met, while also ushering in a new landmark building for the university’s east campus. “We are thrilled that Perkins+Will has created a signature building for the college that will highlight our many educational, research and clinical service initiatives,” Whalen said. The standout design for the $98 million Health Sciences Building will be further accentuated by the fact that it will be fronted by a nearly 1.5-acre green space that will create a natural entryway to the Kettering Lab Complex. University Architect Beth McGrew says that the green space is part of the university’s larger commitment to creating a healthy and equitable campus environment. The schedule calls for the project to be completed in the fall of 2018, which is the same year the College of Allied Health Sciences will celebrate its 20th anniversary. The project is part of a much larger program that is upgrading the surrounding collection of buildings through renovation or demolition and rebuild. That program of work is expected to be completed within the next three years.